Afraid your children are too scared or are you tired of children not listening, talking back, not doing their chores, or teenagers that are running amuck. Worried and don’t know what to do? We are here to help you have loving, respectful, children with a good future ahead of them. Or if you have children or teens that are ADHD, have Asperger’s, are autistic, learning disabled, or otherwise need special help, you deserve help and support. Have trouble with welfare or foster care systems? We can coach you through it. Tired of unrelated tips and techniques to use on children that are hard to remember and seem to be illogical. We will present them to you in a meaningful and easy way to remember. We talked about the four things to remember in the previous pages. Let me summarize them again and go one step further, combining them. The four steps of the brain are a feedback loop that plays in this order: Perception, Emotions, Thinking, and Doing. We perceive, feel fear or love, plan what to do about it, and then act. When the four steps are positive and social we call it our Upper Nature, the ‘Me’. When the steps are negative self-centered we call it the Lower Nature of ‘Me.’ The Lower Nature is our survival mode and when in the survival mode we are less socialized. The survival mode, our Lower Nature, dwells in the lower older part of the brain. If the Upper Nature does not control the Lower Nature, then the four steps of the brain, become Deception, Greed, Blaming, and Bullying. They are represented in the key at the very bottom of the page as different widgets. The Lower Nature is more connected to ‘Myself,’ the body, which loves mischief more than the Upper Nature. When children are in their lower natures they are not very cooperative. They are in nature’s survival mode, it is robotic and overrides the upper nature if the environment is perceived as unsafe. ‘Myself,’ is the body with its inherited ability to see, hear, taste, smell, and touch. These vary with each child as does their innate emotions of fear or anxiety and their love and social abilities. Our children also differ in cognitive or thinking abilities just as they very in physical abilities, some children form habits easier then others. So each child starts out responding differently to the world around them according to the abilities they were born with, or the abilities they have after traumas that may cause brain injures. We need to have a pretty good idea about their innate abilities as that determines how they will react to us. Age is the biggest changer of the body. Older children often can learn a lot faster in many things and usually understand us better. The Upper Nature is guided by Consciousness, Mr/Ms Do or ‘I’ also called Mr/Ms Choice, an ego, and tends to make good choices. The Lower Nature is driven by Dragon, sort of an alter ego, who makes quicker but selfish choices. If the Upper Nature is not developed well the survival mode has a heyday. We want to keep our children in the Upper Nature so that their conscience is operated by correct senses, good emotions, the best of thought, and good behavior. It is their ‘I’ that tries to determine which widgets they want to use, if they want to be attentive or deceptive, social or greedy, clear thinking or whimsical thinking, and good behavior or bad. If their ‘I’ is strong it will choose well, if it is weak the Lower Nature will rule. 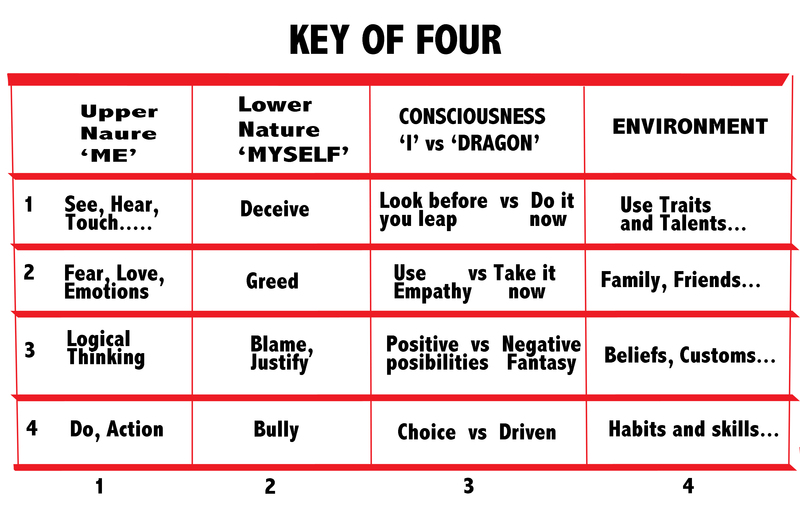 The Environment and good or damaging experiences can influence our ‘Me’, ‘Myself’ and ‘I’ (or Dragon). Education, socializing, and developing talents, habits, and skills can help our Perceptions, Emotions, Beliefs and concepts, and Actions. We must provide a safe and loving environment for our children to help them stay in the Upper Nature, be healthier and pleasant, and cooperative. Part of the environment and the trick of parenting is to make sure your ‘Me,’ ‘Myself,’ and ‘I’ along with Situations are also healthy. Everything we teach here can pertain to you also. There is no difference between the inner dynamics of us and of our children except that of age of development and lack of experience. If we are not up to par our children they may at times be wiser and more correct in things then we are. To fight them when they are wiser will only end up in a worthless struggle between us and them and who can win from that? The INTERPLAY of these four factors, ‘Me’, ‘Myself’, ‘I’, and Situational create our Personalities. It influences and determines our personalities and adjustments. Yes, our personalities and our children’s personalities change as we grow. We want to perceive keener, be happy and motivated, grow wiser and more patient, and succeed at what we do as we get older. We want success and successful children. We want to help YOU, according to your make up, see how YOU can best help YOURSELF and YOUR CHILD, according to their make up. We will help you to raise your children and also, if needed and wanted, will counsel or coach you on improving YOUR Upper and Lower brain, ‘Me’, for success and how to consciously help YOUR ‘I’ be a better executive of the brain’ to direct and improve on the ‘Me’ and help YOU teach YOUR children to do the same, to give you tools to continue to become a more passionate family and community member. This will include how to change the ‘Environment’ to augment your efforts and teach your ‘Myself’ to use abilities, habits, and talents to be safe and successful. The key to all the concepts.